Perfectly situated for captivating experiences, a truly inspiring and gracious venue, King George, Athens is located within walking distance from the wonders of Athens. With 102 rooms and suites, a Penthouse Suite with private outdoor pool overlooking the fabled Acropolis, Tudor Hall Restaurant and incomparable views of the city’s landmarks, King George finds its best expression in the outstanding personalized service. 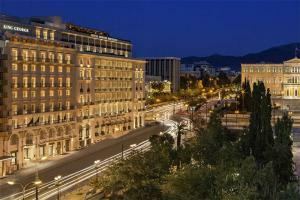 Located just 21 miles from the Eleftherios Venizelos International Airport. Tudor Hall Restaurant & Bar.